KINTARO Horikin here turns his attention to Kintaro (Golden Boy), one of the most popular characters in all Japanese folklore and fact, combining a local fertility god with an actual historical figure. Kintaro was a child, a sort of Superboy, whose prodigious feats of strength and perseverance have served as an ideal for a thousand years. Naked and red-complexioned, the child is depicted in art as fighting and subduing a giant carp. The legend of Kintaro is central to the celebration of Boy's Day each year on May 5. Families with sons fly paper streamers or cloth carp on tall poles outside their houses to symbolize their Kintaros within. The carp (koi) is King of the River Fish for eating. One ancient Chinese tale tells of how a brave carp leapt a waterfall and became a dragon. The carp when caught awaits the knife without flinching. During the course of this project, the subject of this photograph became very ill. Horikin suggested to his client that he might one day bequeath his tattooed skin to the university museum. The man seemed willing, but his relatives objected. Because Japanese law prohibits preservation of the skin without approval by the person's family, this photograph will probably be the only document of this work of art. 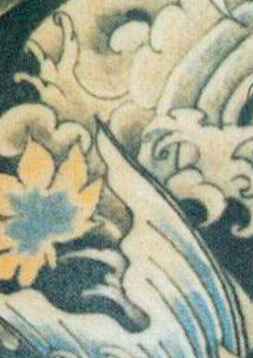 RED KINTARO Another tattoo master, Horiyoshi II, covered his subject's entire back with the cherubic child Kintaro struggling with the mighty carp. Kintaro wears a blue haramaki stomach cloth to protect the hara, or belly, which in Japan is considered to be the source of emotions, thoughts, and intentions. It is the navel specifically to which the Thunder God is attracted in infants, soldiers, and the sick, causing ailments. Hence the protective, warming sash.